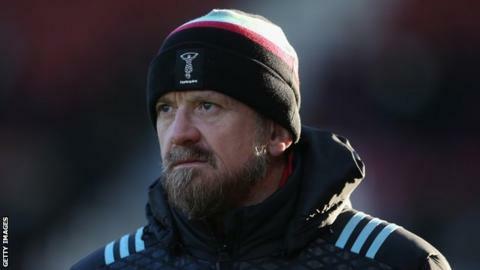 Harlequins forwards coach Graham Rowntree is to leave the club for "personal reasons". The former British and Irish Lions prop has been in the role for the past two seasons. A statement on the Premiership club's website thanked the 47-year-old "for his great contribution and absolute commitment". "The club is incredibly grateful to Graham for all that he has given Harlequins," it went on. Rowntree played 54 times for England between 1995 and 2006 and went on to play in the 1995 and 1999 Rugby World Cups. The former Leicester Tigers player also toured with the Lions in 1997 and 2005, and spent eight years as England's forwards and scrum coach before leaving in 2015 when Eddie Jones took over as head coach.